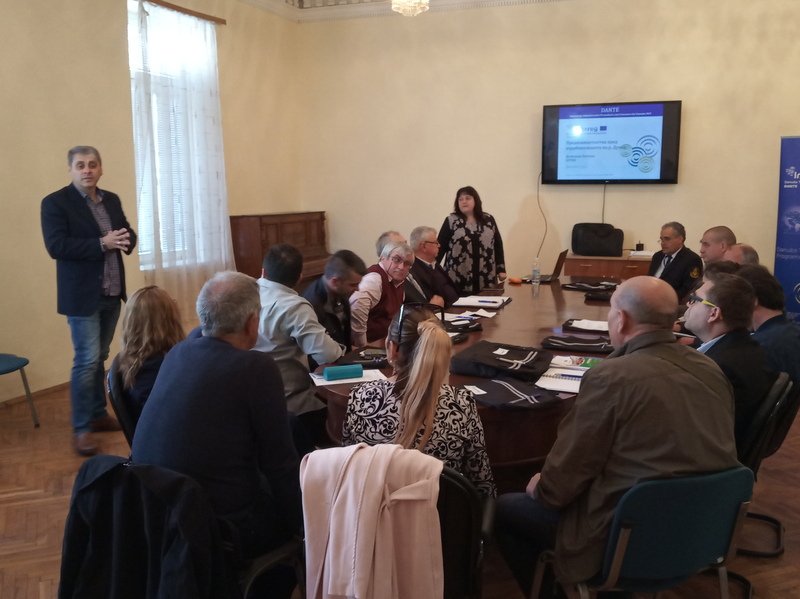 The Bulgarian-Romanian Chamber of Commerce and Industry (BRCCI) organised on 18 March a roundtable meeting with representatives of the responsible public authorities and the industry to discuss about the challenges inland waterway transport (IWT) is currently facing on the Bulgarian sector of the Danube. The main objective of the meeting organised in the framework of the DANTE project was to propose, discuss and analyse measures to improve navigability conditions. Ms. Desislava Pencheva, expert of BRCCI, presented the latest data on existing administrative barriers and good practices at national and transnational level where they are most commonly hindering the smooth integration of IWT in the transnational transport and logistics chain: Border Police, Tax & Customs authorities; Navigation/traffic control authorities; Port authorities/administrations; Waterway and Canal administrations, Other authorities. Among the most mentioned administrative barriers by vessel operators are the lack of standardization and unified regulations, even on a national level; the large number of documents and time needed to fill them; the staff shortage, which leads to long waiting times for vessels; non-transparent and non-consistent tax collection policies in the Danube states; inconvenient work schedule of ports and customs, causing delays in shipments; the lack of a common generally accepted working language along the Danube countries etc. The sample procedures and processes described in the Report on Model Procedures and Processes can be considered as valuable inputs to the Strategy and Action Plan that is currently under preparation. The selected external examples of good practices showthat digitalization has the potential to minimize the administrative burden and and to facilitate and harmonize the processes on the river. The GRENDEL project, which main objective is to support European ship operators to modernize their fleet, was also presented during the event. There are approximately 10 000 inland waterway vessels on the continent, which operate along the Rhine countries, and another 3000 which sail on the Danube. The total freight capacity of the Danube fleet amounts to 2.4 million tonnes and Romania is the country with the biggest Danube fleet – it owns 49,7% of the vessels on the river. Among other things, feasible solutions for fleet modernization are: the usage of low-carbon and alternative fuels; the reduction of air pollutant emissions and of total energy consumption.